The urban project “Les maisons de la Rue Sherbrooke” was an art work commissioned by the Municipality of Montreal as part of the artistic venue, Corridart, for the Olympic Games that took place there in the year 1976. The piece consisted on an actual size facade of a house that mirrored the house in front of it. The architect Melvin Charney, native of Montreal, who was the head planner and designer of the exhibition of Corridart proposed for all of the artistic projects to be exhibited along Montreal’s historical street Rue Sherbrooke. However, due to opposing political decisions from the local Government, the entire urban gallery, including the project “Les maisons” were taken down two days before the inauguration of the Olympic Games. This created great controversy within the citizens and became an iconic moment in the history of the city. I will analyze Charney’s personal intervention “Les maisons de la Rue Sherbrooke” and the way it confronted the city’s identity through a disassemblement of its physical and ideological structures. The decision of monumentalizing a house and opposing to the super projects that were being built at the time was how Charney wanted to develop his critique to the urban form. I will explore these notions by addressing the political context of the time, examining the meaning of the piece and discussing the consequences of its termination. The political situation of the city of Montreal in the decade of the 70s was centered on the expectations the Government had towards maintaining its status as Canada’s metropolis. 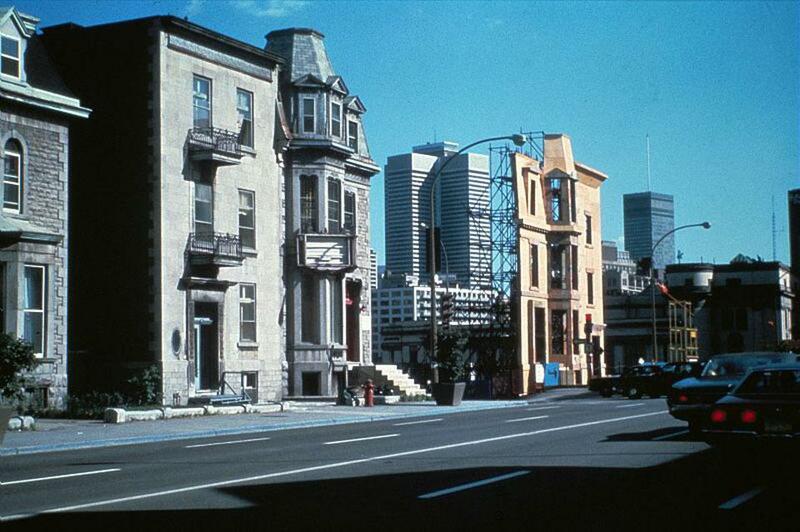 The political forces of the city were making great investments to create a contemporary urban territory following the instructions of the mayor Jean Drapeau. This led to the involvement of the city in several large scale projects that were thought of as strategic plans to increase the city’s tourism but which resulted in great monetary losses as well as losses of the city’s historical patrimony. The Olympic Games, as one example, resulted in massive cost overruns and left the city with a debt of over $1 billion that has taken its citizens over thirty years to fully pay off. Charney’s intention with “Les maisons” was to bring people’s attention to the streets but specifically to the street Sherbrooke. Rue Sherbrooke, the second longest street of the city was described by Charney as “the major artery and processional thoroughfare of the city which signifies an urbanity that evolved when Montreal became an important metropolitan centre”. The work of “Les maisons” consisted on the construction of a house facade made of plywood and lumber that had been thrown away by building constructions. It was held by pipe scaffolding on its back, exposing the facade as an image that resembled a billboard. The openings of the windows were left uncovered and generated the effect of frames for the buildings that were on the back. The project’s intention was to mirror the facade of the house located across the street in a attempt to give a theatrical entrance to one of the main intersections of the street Sherbrooke. The resolution to situate the art work there was based on the fact that the selected site had been abandoned since 1960 due to a change of Municipal orders that destroyed the house that was previously there to replace it with a municipal building. However, the building ended up being relocated at a more convenient place and the site was forgotten. For Charney, it served as an example that manifested a sense of temporality of the city’s memory in the presence of a new political model. He intended on having memory re-appropriating the site in order to question this modernization. “Les maisons” became an exploration of space and image through the form of a house and it managed to expose its fragility when it was mirrored by a two-dimensional facade that stood right in front of it. 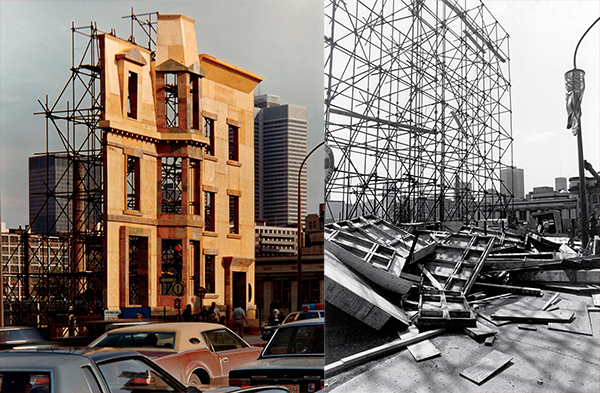 This facade was the representation of an object, but it was also the representation of what was no longer wanted. Rebuilding a “house” in this location meant retaking this space that was once thought for monumental construction, and turning it into the setting that would support the construction of an idea. However, this was not the only concept being worked here since the composition of the work dealt with real construction materials and a real- size facade which to the untrained eye, could have meant a real construction that got interrupted because of the owner’s financial problems. This idea, at this small scale was a metaphor for what was happening to the city at the time. L’affaire Corridart, was the name given by the press to the Municipality’s act of censorship towards the artistic intervention. It has been said that the justification for ordering the removal of the work, according to the mayor, was due to an absence of art in the exhibition. “Why did l’affaire Corridart happen? It was a clash between an old-school civic administration that thought art had to be romantic or elegant, and a new generation of street-wise artists with a social message” (Black, 2001). The struggle between modern and postmodern was being materialized and was not in the Government’s interest to have it showcased to the rest of the world. Black, Barbara. “Concordia’s Thursday Report.” Concordia’s Thursday Report. 13 Sept. 2001. Web. 17 July 2015. Sigouin, Caroline. “Jean Drapeau | TheCartographe.” TheCartographe. 1 Dec. 2012. Web. 17 July 2015.